Most people join a martial arts club to either avoid or dish out some serious punishment. In kumite (sparring) the idea is to apply what you've supposedly learned combined with the spontaneity one could expect during an actual street fight. In the dojo, sparring partners are expected to work with one another; it is not about annihilating the other guy, even if your sensei tells you to turn up the heat. Still, accidents do happen. A nice woman and mother of four (all of whom trained at our school) snapped her pencil-thin forearm one night when she attempted to down-block a front kick. Not one to be easily discouraged, she showed up the following week for class with her arm in a cast. On another occasion a pair of black belts were mixing it up when one of them dropped to the mat. Apparently, a rather low spin-around-back kick was able to exploit the fact that someone wasn't wearing their groin protector. Ambulance trips to the hospital aren't much fun for young karate enthusiasts. He needed emergency surgery, and it was about a month before he was able to resume training. Some lessons are learned the hard way. Sparring gear such as hand-guards are implemented to protect the user, not necessarily with the opponent's safety in mind. Most head-gear manufacturers include a label that reads For Light or No-Contact Sparring Only. That probably does about as much good as the warnings listed on cigarette cartons. The mouth-piece is designed to keep your jaw from breaking, but may not keep your teeth intact as I found out years ago at a tournament. I fear my dentist more than any opponent I've had to face. Starting in April 2007, the World Martial Art Games Committee (WMAGC) is going to revise its rule book to exclude words like "fight" and "fighter" to counteract what it sees as aggressive and violent tendencies in the martial arts. In its statement the WMAGC claims that by omitting words and references associated with fighting and replacing them with mitigated terms (e.g. sparring contest, match, etc.) will lead to less injuries related to sportive martial arts. What all this implies is that "fighting words" send a negative subliminal message to the mind of the combatant (another dirty word?) causing her/him to become overzealous during a match. Of course reducing a karate contest to a glorified game of tag does it no justice either. There needs to be balance. I'm all for promoting the martial arts in a positive way, but perhaps this form of political correctness has gone too far. Changing the words does nothing to change attitudes. The community for fighting using the titles Martial Arts and Karate and Kung Fu and so on propagate this type of violence. Look at tv with the ultimate fighter series and they way they promote it. All one can do is try the best to overcome this type of hype in the class. Even if you end up with no students or maybe one or two. If you can get to those two and they can get to two in time maybe the attitude will change. I plan on opening a class through the city recreation department and suspect that most will come in thinking they will gain rank fast, learn weapons right away and then find that I plan on teaching in a fashion to create proper attitude and good basics. Boring repitition with no movement forward till they get it right for a while. I suspect this will cut the class down to size very quickly. I hope so as I want someone willing to take the time and put forth the effort to do it and make it a life long endeavor. Accidents will always happen and regardless of the nice language. I don't know about karate but both the ITF and WTF still use the "F" word in certain places (i.e., fight). It boils down to whomever it is who is running the tourney and the judges to make sure that the matches are clean. I can certainly see your point that doing combat in the martial arts IS fighting. I can tell you that from a parent perspective (and I know you're a dad) and even from a business perspective, telling parents that we teach "sport sparring" and not "fighting", makes a HUGE difference. More parents will come to our school knowing that we are not teaching our kids to fight, or that the sparring that we do is for home, school, or anywhere else on the mats and without their gear on. The ATA has been adding more and more protection gear over time to protect their membership, and while people whine about it at first, eventually they get used to it. I can't IMAGINE sparring without heargear, mouthgear, punches and a chest protector at all! As of June 2007, a new requirement of having a faceshield (and it can't be that cage kind-- certain ones are approved) as part of your gear will be going into effect. I've already gotten mine, and yes, I do have to get used to it. I still have to wear my mouthguard, but I've known too many kids who have gotten hit in the face (and the face is off limits, even when kicking) and would've been better off with the faceshield on, so I'm all for it. Even my overprotective husband was happy to hear of the requirement, and was glad that I was one of the first to get them for my son and I. While I can appreciate that it takes the "fight" away using different langugage and wearing all sorts of protective gear, in the end, for the majority of the people who participate in martial arts, it really only protects their physical well being more than before. You should see how some of the ATA goes at it at tournaments, and it's supposed to be "light contact"! Believe me, even I go all out as best as I can. (As you know, sparring is not my forte'). Besides, it also brings up another point, which is a HUGE emphasis in our school when it comes to sparring vs. fighting anyway-- it's all about control. If there isn't true control, then yeah, it's fighting. If there's some control in how you are in combat, then that is more like sparring. Perhaps in changing the language, they are trying to emphasize the idea of sportsmanship as well as needing a bigger role in control. Good article, John. In a related vein you might find this one interesting: http://www.damninteresting.com/?p=494 (Sorry, I don't have a handle on html linkage yet). Injuries are regrettable and not something to be courted, but they are an inevitable risk of what we do. Trying to take the words fighting and fighter out of what is already martial arts seems pointless, not to mention a bit silly. Changing the words does nothing to change attitudes. Exactly. And the way to change attitudes has to be developed in the dojo, not by a commission. Basically the guy who's running the ring is calling the shots. If (s)he's competent, then all is well. In poorly run tournaments, things tend to go awry as far as interpreting the rules go. For a school that promotes self-defense (especially with the kids) that really doesn't emphasize sport I can see the use of this language. But not for competitors. Thanks for the link. It's true that practitioner's can become reliant on protective gear. Don Nagle and his generation fought without it, but a lot of people from that era got seriously hurt. One day after sparring, my instructor brought up two students (after they shed their gear) and had them square off for another round of sparring. Needless to say, they weren't throwing caution to the wind, nor were they loading up on their shots. While I'm generally in favor of protective gear, this particular story shed some interesting light on its use. Words will be words. I'm often sad to see these things. And especially who uses them and how. Even harder to accept when they're close. I guess the larger issue is ... judgement? or is it respect? I see what you describe in your text as symptoms of something that's been gradually fading. This lack of balance is a symptom of something greater. But I can't quite put my finger on it. Statistically, Martial arts do not rate very high on the injury list. I read an article a while ago that had it lower then golf. Here is a different report, since I can't find the original. If you google "Sports Injuries Statistics" most articles do not even list Martial arts in the top 10 or 15 activities. In my experience, the most sparring injuries occur when a school/athlete come to an event ill prepared. There are many schools who do not really train their students to spar, yet have no problem sending them to a tournament. I truly feel the reason why I have had so few sparring injuries in my class, is because we spend a lot of time on sparring drills, not just sparring, so when the students get in the ring, they have a very good understanding of what to expect, and what they are capable of. Sometimes lack of respect and judgement is the cause of injuries, unfortunately. More often than not, that's not the case. One way or the other we all get them eventually. The real problem occurs when we try to get back on our horse too soon. There are many schools who do not really train their students to spar, yet have no problem sending them to a tournament. I can believe it. First hand I know some schools clearly spend more time on sparring, especially geared towards tournaments, than others. Obviously it's grossly irresponsible to send somebody out to compete who isn't up to snuff. Statistically, Martial arts do not rate very high on the injury list. I read an article a while ago that had it lower then golf. I saw those stats - couldn't that be due to the fact that far fewer people partake in the martial arts than basketball, or football, or even golf? Unless I misread something, a lot of those figures reflect activities sans coaching (recreational), which definitely could explain the high rate of injuries. I saw those stats - couldn't that be due to the fact that far fewer people partake in the martial arts than basketball, or football, or even golf? That report is not as good as one I saw a couple of years ago that showed percentage of injuries based on number of participants. The other thing is we have no idea what is included in "martial arts" - does it include MMA, Kick boxing, Tai Chi? I guess the point I am trying to make is the general public assumes that martial arts are high risk because it involves "fighting" - but in reality, football, hockey, lacrose all have as much or more contact. Sparring was always a thorn in my side. The "light to medium contact" always turned in to a bloodsport. A friend of mine who runs an Isshinryu school (big ex-tournament guy) told me he's seen more injuries in point-matches than the continuous-fighting variety. I'm not really sure what the reason for this is, but suffice to say, the training focus and preparation for these two events are totally different. The "light to medium contact" always turned in to a bloodsport. The problem actually has to do with instructors who don't know how to set limits with the heavy hitters. Students have a perfect right to speak up, especially in light of the fact that they're paying somebody to properly teach them and guide them in the martial arts. I'm with you on that one. I'm so tired of everything having to be P.C. all the time. Catering to the lowest common denominator (those who would come to the tournament to do harm) gets really annoying. Any good martial artist knows that control is key, and that the most control should be exercised in a tournament setting. If they want to do something to eliminate the negativity surrounding those words, then they should actively seek out those who come with the intent to do harm and ban them from future tournaments. That will teach them, without having to water everything down for those who already exercise control. If they want to do something to eliminate the negativity surrounding those words, then they should actively seek out those who come with the intent to do harm and ban them from future tournaments. To tell you the truth, I've personally never heard of somebody being suspended from competing because of habitual foul play, but competitors do get disqualified in matches. One guy I knew was removed for biting his opponent! This is the kind of wackiness that needs to be addressed, not the wording of a rule book. Wow, that was interesting! I never knew that Martial Arts rated so low on the Sports Injuries side. I love sparring and it is one of the things I miss most about not having anyone else to train with! At my school (as is true of most, I suspect) sparring only started once you had reached a certain level. Sparring in our school was all about respect and control - key elements, I believe, as mentioned in some of the posts, to prevent 'sparring' from becoming 'fighting'. I'm not sure the distinction is only semantic. We used no protective gear at all and I feel ambivalent about its use - I think there is value in knowing what a strike can feel like, even if it is controlled. And yes, I was injured - dislocated fingers and (slightly more seriously) bit through my bottom lip in a fall that went bad. But both things taught me about pain and how to handle it - also an important part of Martial Arts. We used no protective gear at all and I feel ambivalent about its use - I think there is value in knowing what a strike can feel like, even if it is controlled. Good point. The student really has to get used to getting hit! Protective gear is mandatory in the States for insurance purposes, but obviously there are no hand-guards or mats in the street. "Changing the words does nothing to change attitudes. " Wow.. The first thought that I had as I read this thread was "changing the words won't change the thoughts of the sparring partners.." Which was echoed by the first comment on here. I have the thought that many injuries occur from improper technique: For example, improper placement of the toes, thumb, wrist, etc. 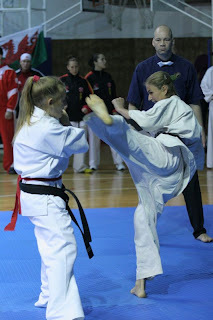 or as you mentioned.. trying to use a small forearm against a strong front kick. It's quite a strange mind thing.. sparring.. You have to apply attacks, and try to simulate a moment of defending yourself, and yet there has to be control involved because your partner needs to go to work to support their family/ themselves the next day. Broken toes is a big one in karate, although I've been lucky with that. Wrists collapsing from punching, especially rotating punches, is another problem. Blocking is really similar to getting hit, and of itself doesn't accomplish much. Blocking should be used as a last resort - I always encourage the student to make the opponent miss if at all possible; it puts the defender in a better position to counter while extending the longevity of both parties. In Isshinryu, we block with the muscular part of the forearm, but even that has its limitations. Blocks can also be used as strikes, but they're hard to execute in dojo matches with protective gear and so on.